2x 1x Barco Encore Video Processor. 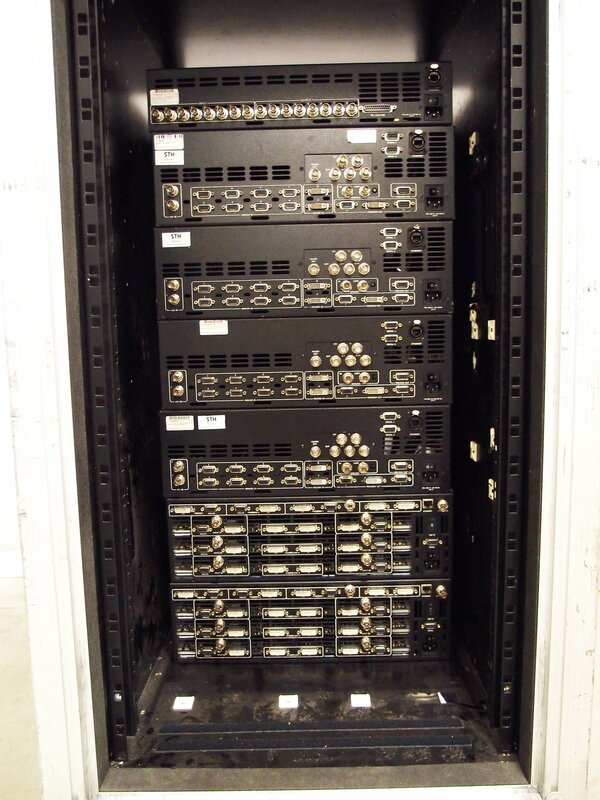 Offers welcome for complete rack or individual units, controller units also available. The MatrixPRO 8×8 DVI router switches any of the eight DVI inputs to any or all of the outputs. Each channel can be programmed with unique EDID information based on the system requirements. This information is also available to external sources, even when the unit is turned off. Each input is re-clocked as it passes through the router maintaining the DVI signal strength, and each output channel can also display an internally generated test pattern. The MatrixPRO 8×8 DVI router accepts inputs up to 2,048 x 1,080 (including all HD) resolutions. 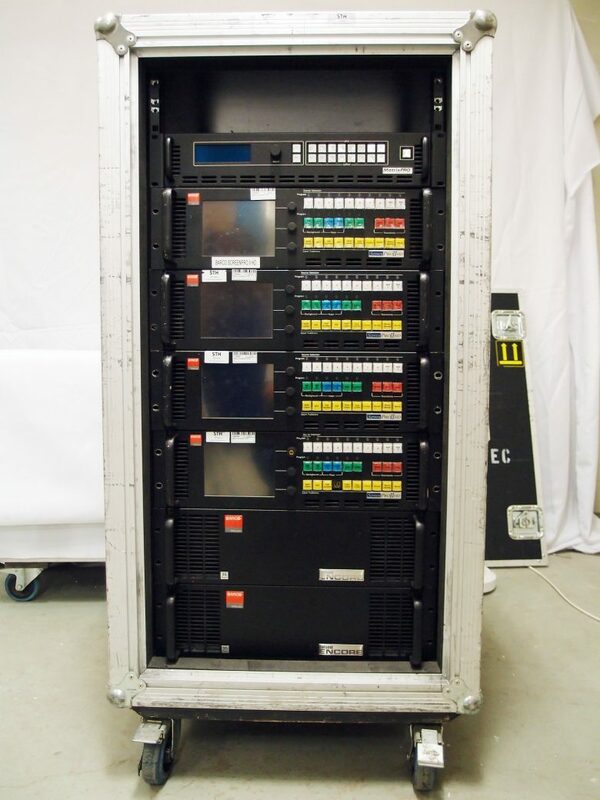 The unit is controlled from the built-in front panel, the MatrixPRO remote panels, the MatrixPRO software and the Encore and ScreenPRO-II controllers. The front panel includes an easy to read VFD display and a knob for simple navigation of the menus. The menu structure is similar to the rest of MatrixPRO router family. Communication with the remote panels or the software is established by either Ethernet or RS-232 protocols. The MatrixPRO 8×8 DVI is also automatically recognized by the Encore and ScreenPRO II controllers. This allows for full integration with Barco’s image processing tools. ScreenPRO-II uses four image layers (unscaled background, up to two scaled PiPs or keys, and an unscaled downstream key) to produce sophisticated effects, including live transitioning backgrounds, transitioning PiP windows, wipes, dissolves and keys. An internal 8×2 analog video router provides universal analog sources to each scaler schannel. Barco’s ScreenPRO-II features a low video processing delay of three input fields maximum. With the EOC, the ScreenPRO-II can use the DVI background channels as inputs to the scaler channels, adds HD-SDI and interlaced output for recording, and can have storage for 100 logo stills. Using the mixer’s two scalers, you have the flexibility to mix or key HD-SDI, DVI, and analog source on top of the transitioning background, or display two independent PIPs (or Keys) over a background. In addition, two unscaled high-resolution layers enable you to transition seamlessly between backgrounds, or use a background plus a high-resolution DSK. With ScreenPRO-II, the term ‘seamless’ goes far beyond the system’s ability to create clean, glitch-free switches between inputs. With a typical single-format switcher (such as an all-SDI system), ‘seamless’ is easy – because input timing is uniform. However, when multi-format and multi-resolution sources are connected simultaneously, the clean switching challenge arises, and that is precisely where ScreenPRO-II shines. The EOC card provides an additional output that can be programmed to a different resolution from the Main/Preview outputs. The additional output is provided on the SD/HD/3G/BarcoLink and five-wire formats. The EOC card also enables the DVI inputs to be routed to the scaler channels. Finally, the EOC includes a memory card allowing the storage of up to 100 logo stills. 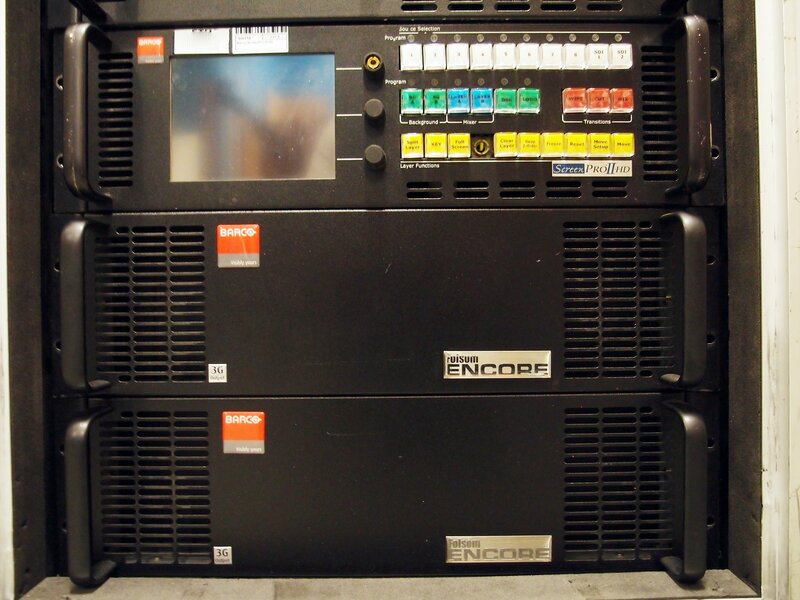 The Encore Video Processor (VP) is the heart of the Encore Presentation System, providing all input, output, layering and wide screen “blending” cicuitry. Packaged as a 3RU rackmount unit, each VP can be outfitted with one, two or three Mix/Effect (M/E) boards to meet different application requirements. Models ordered with one or two M/Es can be easily upgraded by adding additional M/E boards. Each M/E provides two independent Athena scaler channels, Barco Folsom’s proprietary scaler that supports universal inputs (for both analog and digital video sources) and smooth real-time PIP movements and re-sizing based on user specified keyframes. Within an Encore system, each VP is essentiallya single destination, and multiple VPs can be combined to create advanced systems comprised of both single and blended destinations. Each VP’s output board provides Program and Preview outputs in both analog and digital formats, plus interface, blending and data-doubling functions which are required to support wide screen applications. Supported output resolutions include computer resolutions up to 1600 x 1200, analog HDTV resolutions including 720p, 1080i, 1080p, HD-SDI, 2048x1080p Digital Cinema video, and plasma display resolutions. Output synchrolization is supported to lock the output frame rate to an externally applied NTSC/PAL black burst signal. In terms of input flexibility, the VP accepts standard component and composite analog video formats (NTSC, PAL, SECAM), SDI video, computer resolutions up to 1600 x 1200, analog HD formats including 720p, 1080i, HD-SDI Video, 2048 x 1080p Digital Cinema video, and Plasma display resolutions. In addition, the Athena scaler features 1:1 pixel sampling, motion adaptive de-interlacing for both standard and high definition sources, 3:2 and 2:2 pull down detection, low video delay, aspect ratio correction, image cropping and real-time window resizing and positioning. A VP configured with three M/Es supports six independent PIP or KEY images, or three transitioning PIPs ¯essentially, the M/Es are the system’s “layers”. Two un-scaled background channels provide a high resolution backdrop that also supports seamless transitions. Down Stream Key (DSK) effects are supported by a third un-scaled high-resolution input channel. In terms of creativity, PIPs and KEYs can be sized and positioned anywhere on screen in real-time. Z-order control is used to assign layer priorities to each PIP or KEY, and PIPS can also be linked in pairs to support transitions, or displayed (and transitioned) independently. Keys are used to provide effects such as titles and special masks.